I’m torn. I mean, this book is good. Very good. Great, even. It’s everything you could want in a fantasy novel, and it ticks those boxes so firmly it tears a hole through the paper with its overly-sharp pencil. But when I compare it to the first one it… it just falls flat. Now that’s nothing to be ashamed of. Considering my amazingly-glowing review of the first one (reviewed in parts 1 and 2 because I was so in love with it and couldn’t espouse all its qualities in a single measly review) it should come as no surprise that other books will struggle to match my opinion of the Way of Kings. And that’s okay, because it’s not fair on the book for me to do so… unless it’s the second in the series written by the same author, of course. 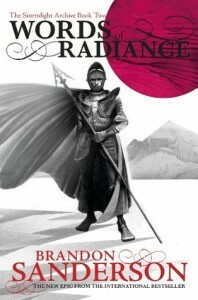 Words of Radiance continues the story of Kaladin, troop leader turned slave turned bodyguard turned something else entirely, and Shallan, sheltered noble girl turned scholar turned spy turned something else entirely. Along the way we catch glimpses of stoic Dalinar, of fiery Adolin and of many other characters that flit in and out of these pages. Each character is as compelling as the other, though of course I do have my favourites. The story is amazing, the characters believable, the pacing fine. So what didn’t I enjoy about it? Well, let’s see: After thousands of pages, I’m starting to tire of Shallan’s overly-verbose comebacks and banter. She’s intelligent, she’s witty, we get it. I tire of the back and forth conversations that don’t seem to show much more than what’s already been shown. The philosophical waxing, though somewhat necessary to the story I understand, is also getting tired. But most of all, there’s a large chunk of the book where nothing appears to be happening. There’s a static friction, an equal push and pull between forces that doesn’t quite build the tension that, I believe, Sanderson was gunning for. Furthermore, the political intrigue just isn’t as detailed and believable as that of Martin’s. But honestly? I can excuse all that, because Sanderson writes the best action scenes, the greatest world-building, and the most breathtaking climaxes I’ve read in a book. When the tension escalates – and boy, does it escalate towards the end of the book – it’s released in a magnificent, chaotic, cacophonous way that left me whooping in joy. So is Words of Radiance the best book I’ve read? No, not at all. But is it a great book in its own right? Definitely, and it’s a worthy second entry in the series. Now, bring on the third!